I recently read A Short History of Nearly Everything by Bill Bryson. I am a fan of Bill Bryson's books (Walk in the Woods, I'm a Stranger Here Myself, etc), but this book was a little different. As the title suggests, it is a book that covers a large array of subjects. While it doesn't cover "nearly everything", it does cover a huge amount of time, from the Big Bang on. Subjects include astronomy, geology, physics, chemistry, anthropology, and evolution among other things. Although Bryson is no scientist, and there are no new discoveries here, it is an interesting read. Bryson is a great storyteller, and does a decent job of explaining complicated things. The real strength of the book is the stories about the people behind the discoveries. Breakthroughs often come after years of struggle, sometimes as a byproduct of a different study, still other times in a flash of insight by someone barely associated with the field. The book does a good job of describing the personalities, and the conflicts between them. There is an interesting quote in the book credited to Alexander von Humboldt: "there are three stages in scientific discovery: first, people deny that it is true; then they deny that it is important; finally they credit the wrong person". Last week I finally got back on the bike and in the pool in the same week. The half marathon on Sunday helped bump up my running totals as well. The Seafair Half Marathon had a new route this year. The marathon has been around for a few years, and the past routes have run mostly around Bellevue. This year, they renovated the course substantially with it starting in Seattle, running through Kirkland and finishing in a downtown park in Bellevue. 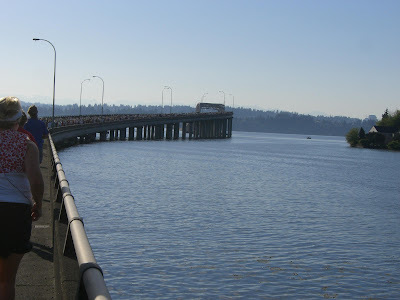 This meant that all participants were able to cross Lake Washington on the 520 floating bridge. This opportunity is what hooked us. If you are not from the Seattle area, you may not have seen a floating bridge before. Lake Washington is quite deep, so a floating bridge is a somewhat novel solution. There are actually two floating bridges across Lake Washington, and the Evergreen Point Floating bridge (520 bridge) is the longest floating bridge in the world. There are wonderful views of the Arboreteum, Lake Washington, Mercer Island, and on a clear day Mount Rainier. This is the first time in 24 years that the bridge has been closed for a race. Again, we were hooked. We have had unseasonably warm temperatures the past couple of days, and today promised to be a near record breaker. The highs were going to be pushing 90 degrees, and we just aren't seasoned for running in these kind of temps. It was pretty clear that we weren't going to be setting any new PRs, and we were just hoping to enjoy the sights and stay hydrated. With memories of the Chicago Marathon meltdown last fall in our heads, we all wore fuel belts with our own fluids. I decided to carry a camera with me as well, to varying sucess. The route started by Husky Stadium at the University of Washington. The Seafair Pirates were there to lead us out. We started a bit late, but at 7:15am the Pirates shot off a canon and we were underway. Within about a half mile we were looping onto the freeway. The bridge heads east into the rising sun, and sweat was pouring off my face within a mile. I tried to take it reasonably easy but there was no fighting the weather. Running across the bridge was a great experience, and I tried to capture some shots while I was running, but it was tough to do it justice. Four miles in we were off the freeway and heading into Bellevue. 84th Ave was wonderfully tree-lined, and a welcome break from the sun. I may have slowed my pace a bit to prolong the respite. The route wandered south along Lake Washington blvd with occasional water views, before turning toward Main St in old Bellevue. The wife was stationed there to cheer us on. She had run into friends from her hometown by chance, so there were a couple unexpected friendly faces to greet us. I was of course very warm and struggling in the heat, but was still doing OK. Then we hit the wall. The hill at mile 7 that was a mere bump on the map turned out to be very long and steep. I would say it is the steepest hill I have run up, but in truth there wasn't much running going on. With my heart rate shooting through the roof I walked a good 2/3rds of the hill. My running pace wasn't much better than a walk anyway. And it was up and down for most of the rest of the course. There was clearly some graphical smoothing on the course elevation chart. 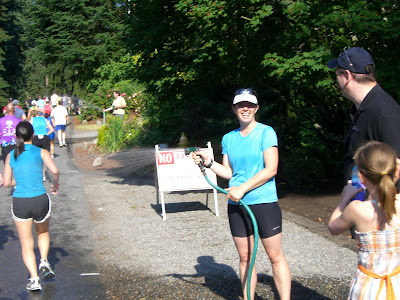 Fortunately we were running through neighborhoods at this point, and some wonderful Samaratins were out with their hoses dousing the melting runners at they went by. These folks saved our bacon. The last three miles took us to downtown Bellevue. The full marathon course split after mile 11. I don't know if I could have made the turn. It was all I could do to run two more miles, and I can't imagine tacking on another 13 on a day like today. At the finish line it was clear a few people cut their marathon short, but fewer than I expected. There was one more ridiculously steep (walking) hill at mile 12, but the last mile was a glorious downhill to the finish. The finish line was next to a beautiful downtown park, and the wife and friends were cheering us on as we came running down the chute. I finished in 2:07:42, which is about 6 minutes slower than my best, but all I could have asked for today. It is just so backwards - I go to sunny Huntington Beach California and run in a torrential downpour with 30 mile per hour winds. Today I run in Seattle and bake in the sun. I finally got around to repairing our garden hose connections. Both the hose bibs out front and back were leaking when they were turned on. This meant a bucket underneath to catch the water every time we wanted to water the plants, etc. In addition to that, the hookup to the sprinkler system out back was also leaking. Somehow the hookup between hose and PCV broke. In the meantime I had to wedge something under the connection to keep it from leaking. Not a great solution. With the leaking hose bib, I also couldn't leave the water on to the sprinkler system, so it wasn't terribly automatic. So after a few trips to Home Depot to go through the bins of connections to try to visualize how it was all going to come together, I finally found all the right pieces. The best part was being able to use the crescent wrench I inherited from my father in law. I really had no use for it other than it was cool. I couldn't get the old hose bibs off, and the wrenches and vise grips I had weren't giving me enough leverage. Then I remembered the crescent wrench hanging in the shed. I put the tape measure out to show you the scale. It is 2 feet long! Almost worth mounting over the fireplace. This past Saturday we had a little blowout to celebrate two of our friends kicking cancer this year. Alyssa found out she had breast cancer in December. She had a double mastectomy, went through chemo treatments, and is now in the reconstruction phase. Tami found out she had a carcinoid tumor in January. Fortunately it was slow growing and she didn't need to have radiation or chemo. Both now have a clean bill of health! Some friends his past New Years coined the phrase "Everything's Great in 2008". Well it hasn't turned out to be such a great year so far for friends and family. As Sean mentioned in his post yesterday, this is one of those years we will probably want to pack away when it is all over. More bad news came in from two different friends just today. When the slideshow of photos goes by in the future, the happier times will be highlighted (and there has definitely been highlights), but it will be tough to completely forget the struggles of 2008. It was important to acknowledge and celebrate Alyssa's and Tami's recovery. But of course I forgot my camera. They took off this morning. I am jealous. Someone from my wife's work is on the ride this year. She has a blog here. Hopefully she will have a great ride and will be able to post some notes and pictures along the way. A Big Ride friend of mine lead them out. He is a past Across America rider and it is a tradition for past riders to lead out the new riders. They lead the current riders out of town and stay with them through the first day or two. They answer any questions on the road and in camp. It is a great tradition, and a great community of people. And of course the ride raises money for the American Lung Association. George Carlin passed away yesterday. A Place for My Stuff was one of the first cassette tapes I bought. He was fascinated by language, fought against political correctness, loved to point out our foibles and the stupid things we have in common. He joked that his routines were things you know, but forgot to laugh at the first time around. He commented on politics, religion and any other taboo subject. His famous Seven Dirty Words you Can Never Say on Television led to a Supreme Court case with the FCC. The following clips are some of his more relatively clean routines, but beyond the Baseball vs Football clip, they aren't totally work computer friendly. I have had a tough time getting back into any sort of training rhythm since being out of town for a couple of weeks in May/early June. Exercise is such a habitual thing that when I stop doing it regularly, it is too easy for me to skip it. After returning home, each run seemed to be a struggle of will against a rebelling body. I did a bit better last week, but it may be a few more weeks before it becomes second nature again. The threat of an upcoming event seems to help too. We have a half marathon this coming weekend and some bike rides on the horizon, so it is time to hit the road again. The wife and I were watching Dirty Jobs on the Discovery Channel. This ad/promo came on. It was previously posted on TMST, but I think it good enough for another visit. I love the mountains, I love the clear blue sky... It never gets old. While we've been working in the backyard, garage, etc. we've had the mp3 player plugged into the portable speakers. I typically listen to albums or playlists, but I've had it on shuffle for the last few days. It makes for some odd combinations. The Muppet Movie followed by Ben Folds Five, then Tesla followed by a Christmas song. My player can't hold all of my CDs, so I didn't hear any really obscure stuff, but definitely some stuff I hadn't heard in a while. The wife and I (mostly) took today off from work to do a little spring cleaning. And not a moment too soon since Summer officially started at 4:59 this evening. Part of it is leftover energy from the Linden Home Makeover. I came home and looked at our home with a fresh set of eyes and a new perspective. It is amazing the difference you can make with only a bit of talent but a lot of work. I've been trying to head out into the backyard as soon as I get home to work on the yard. We've maxed out our yard waste containers, so it was time to head indoors. We have never parked a car in our garage, and even after today it still isn't possible. Along with our own clutter, we have quite a bit of stuff inherited from my father-in-law. We did make great strides today, at least opening up some walkways around the stuff. There are still some large pieces of furniture, a washer and dryer, dining room table and chairs (Linden 311 leftovers) and some bikes - motorized or not. Next step is a garage sale/Craigslist firesale to get rid of the larger pieces. While the wife focused on the garage, I spent some time in the shed. It was as bad or worse than the garage. It was tough to take more than a step or two without tripping over several things. Tools piled on top of camping equipment, spilling over onto yard tools, burying the sports equipment. About all there was was a path to pull the lawnmower in and out. Now everything is much better organized and it doesn't feel so claustrophobic. We really just scraped off the top layer of everything today. There is plenty more to do in the yards, and we've barely begun to thin out our stuff. Like others, there are boxes we haven't opened in the last couple of moves. Even so we filled the back of my truck with trash and recycling. I have plenty of projects in mind, but for now we need to concentrate on the cheaper fixes. There's certainly plenty to keep us busy. Canned Bacon! Ready for your next camping trip or your nuclear bomb shelter. There is about 3 pounds (before cooking) of bacon in each can, and the shelf life is 10 years. Not sure if a 10 year shelf life is a good thing or a bad thing. Here is a talk show testing it out. Sounds like it is actually a decent product. And if you can't get enough bacon, there's always the bacon of the month club! * Thanks to Brent for forwarding this breakthrough to me. On my way to Marymoor Park for the bike ride on Saturday, I was pretty sure a minivan was following me. It matched every lane change I made and wouldn't pass me. I couldn't tell for sure, but I was betting there was a bike on the back of the van. We pulled into the park together, and the driver fessed up that she had followed me for about the last half hour. She wasn't sure how to get to the park, but she figured following a truck with a bike on the back was a safe bet. Reminds me of the time the wife followed a car when she couldn't remember how to get to Ballard. The car had a "Visualize Ballard" bumper sticker. It lead her straight there. The Flying Wheels is an annual bike ride around the eastside, kind of as a prep ride for the coming 2-day summer rides. It is a relatively hilly route, and offers a 25, 45, 65 and 100 mile route depending on how much training (if any) you've done in the Spring. The bonus is that you can decide that morning, or even part way through, which route you're up for. I have not attempted the 100 mile route yet, and with the weather and running schedule the past few months, we rode the 65 mile route. I was riding with Brian and Cherie, but also meeting up with some Big Ride friends. There was actually a pretty big group at the starting line, and we ran into each other here and there along the route. As always, it is great seeing everyone out on the road. The hilly route verified that we hadn't done a sufficient amount of training. You'd think with the running I've been doing, it would translate pretty well to the bike, but it doesn't quite. Different sport, slightly different muscles. My knees bothered me for the second half of the ride because I haven't been on the bike much at all. Unfortunately I had to peel off from the group around mile 40. I was meeting friends I hadn't seen in many months at 3:00, and I was already going to be late. Summer weekends can get pretty crazy, and it has already begun. The Big Ride group had stopped for coffee in Carnation. I heard a shout as I rode by, but I couldn't afford to stop. Crappy, because I hadn't seen most of them in months either. While we were riding, Cherie let me know that another of our friends is thinking about taking up bike riding and joining us on a weekend ride this fall. Biking is such a great excuse to get together, allows you to catch up while getting some exercise in, reveals some great backroads in our area, and it is spreading like a virus. We'll infect you all! This was a refrain from the Lindens when we decended on their home for a week. Probably still a little dumbfounded by the outpouring of people and energy heading their way, there was no way to sum up their real feelings but to simply say thanks. At the same time they seemed to feel it necessary to appologize for the home's condition and the work ahead. Probably after expressing their feeling to the first wave of friends, it became the shorthand of "Thanks! Sorry!" as each new person came through their door. As the week progressed, the phrase was often followed by a chuckle. A new catch phrase was born. Sometimes when we say 'thanks', there is an implied 'sorry' behind it. "I really appreciate your coming to help, and I am sorry I interrupted your day/put you out/couldn't do it myself." I don't know anyone who thinks they deserve all the help they receive, and isn't a little sorry to ask for it. Of course friendship is putting up your hand in the "I don't want to hear it/it was nothing" position when the 'sorry' part of the sentiment comes out. We also know any favor will be repaid to us, or more likely, we are already in your debt. And of course the returned favor is not our reward, but the friendship and community we find at your side. I just got my new driver's license in the mail today. I'd like to say it is a bad picture, but it is probably accurate (unfortunately). I look like I've been stung by a swarm of bees and I'm having a bad reaction. I don't know if it is like hearing yourself on tape (my voice sounds awful), but I didn't think I looked that heavy. I carry around a copy of driver's license with me at my skinniest. I know I'm a long way from that one, but I look noticeably heaver from just the last one. I will be adding Google ads and search tool bar in the next couple of days. We'll see what sort of ads they come up with. If it is annoying, it will go away. Any profits (assuming there are some)will go to Annabelle. Tip of the hat to Jennifer for forwarding this Robert Ariail cartoon. After all, it has the best climate on Earth. I got a parking ticket this afternoon. Our office has only two dedicated parking spots, so most of us are parked on the street each day. There is a 3 hour limit on street parking. In the beginning, I moved my car every few hours. After forgetting a number of times, and the fact that no one ever got a ticket, I stopped bothering. Well they got us today. We were in our weekly meeting and during a smoke break my broker noticed tickets on our windshields. The city has a nice technique of collection. If you pay the ticket within 24 hours, its half off. So off to the courthouse I went. In other traffic related news, as of July 1st you can be given a $124 traffic ticket if you talk on your cell phone while driving (without a hands-free device). Not that I do a lot of talking on the phone, but I do get the random incoming call now and then. I already have a headset (actually two) I can wear while driving. But as the wife says, it is just one more thing to remember to charge. I sense many calls going to voice mail. Still waiting on our stimulus checks. I think the program to send out $300-$600 to taxpayers was a poor plan. I think something a little closer to the New Deal where the government put people to work would have been more beneficial. We have plenty of roads and bridges in need of repair, lots of national and state parks in need of maintenance, etc. The stimulus money would still end up in the economy, and we would be improving our infrastructure. Not that anyone asked me. I know sending a check to everyone provides a quicker impact and more political punch in an election year, but if we're going to add to an already enormous deficit, it would be nice to have a long term benefit to show for it. If it was impact we were really looking at, my understanding is that extending unemployment and food stamp programs have the greatest impact overall. I'd like to say I plan to send our checks back on priciple, but we behind the 8-ball like most everyone else. Bad plan or no, I'm ready for the check in the mail. In checking the IRS website, it looks like we might be waiting a while yet. This last trip I had no Internet access, no TV, no newspapers. Completely out of touch with the outside world. I get home and catch up on the news and the Mariners are 18 games under .500, gas is up to $4.29, its going to snow in the passes, and we're going to have our own June gloom through July. In other news, tomatoes are being pulled from restaurants. I knew they were evil. Well, I haven't been running in the last 3 weeks or so, but Tami and I had a local 10k on the calendar today. I actually packed my running gear down to California thinking I'd get in a few runs last week, but I was clearly deluding myself. It had been raining all week, so I wasn't sure if we were still on or not, but Tami e-mailed last night to say she'd "put her big girl pants on" and run. It was a small, very local race. We actually walked to the starting line. There were only 56 10k runners and 60 5k runners, so there was no lines at the porta-potties, plenty of food before and after, and a fair chance to win a prize. There may have been as many volunteers as runners. It was a chilly morning, but the rain held off for the day. We started out quickly (no crowds making us start slowly) and ran together for the first couple miles. Tami and I split off after the first hill and I ended up trading leads with a couple girls most of the way. The course was a bit hilly, but there was a great downhill about mile 5 that really gave me a boost and I was able to catch a couple of runners near the end. I hadn't really run a 10k since October of 2005, so I was pretty sure I could set a new best time. I came in at 53:24 cutting a decent chunk off my last 10k time. Pretty happy with it for how tired I was this morning. Tami actually placed second in her age group at 56:29 earning herself a silver medal. There was a raffle afterwards with quite a few prizes, and I walked away with a $50 G.C. to a local grocery store. A new PR, and I turned a profit. Definitely worth getting out of bed early this Sunday. Plenty of great words have been posted online about the event in various places. Sean did a great job of posting a daily record complete with pictures and video at Annabelle's Circle. We even made the local paper! I thought I'd throw in my own compressed version of the experience. I arrived in Lemon Grove May 23rd and got to stay with the Lindens the night before everyone descended on their place. The calm before the storm. The original intention was to kick them out of the house after the first day so we could keep some of the projects a secret, but we may have realized early on that we needed all the helpful hands we could get. They stayed through the weekend and Memorial Day. I am glad that they were able to see the wealth of friends, friends of friends, and complete strangers wiling to lend a hand. The first weekend was a big push of people getting to know each other while we tore out windows and walls, dug out the yard, and scraped off the old paint and dirt. Tearout day is one of the best. You see so much progress, and it is pretty fun too. Some folks got started on their individual projects; Arik in the garden building planter boxes, Dave retiling the kitchen counters. It was great having some folks who knew what they were doing and were ready to go at it. By the end of the holiday weekend we had the new window and sliding glass door in, the insulation and some sheetrock up, and a significant pile of concrete and yard debris out front. Tuesday after Matt and Holly had left, we had a new group of enthusiastic helpers so we set them on tearing out the roof over the deck and prepping and painting the house. Again a number of them didn't even know the Lindens. The sanding of the floors also began in earnest. The job would be tedious with many people lending a hand, but largely headed up by the ladies. It would go on for days. This was one of the wonderful things about the project. No one hesitated to jump in wherever they were needed. There was ditch digging, rototilling, hauling concrete, scraping paint, endless sanding and grinding concrete. Lots of hard and boring jobs, but no complaints, just progress. The middle of the week saw some setbacks. It started to become clear that we may have started more projects than we could complete, the sewer backed up into the laundry room and bathtub, and the code enforcement officer stopped by the jobsite. He called out the building inspector, and though they seemed willing to work with us, they wanted us to stop work on the family room. This was of course the focus of the week, so it was pretty discouraging. We moved outdoors and took on the deck, landscaping, irrigation, painting, tilework and assembly of the gazebo. We were chasing daylight each day. Even though dinner would arrive, many of us would keep going reasoning we could eat in the dark. That was another unexpected surprise. Someone arrived every day with both lunch and dinner for the crew. Every day. There was also bagels or donuts for breakfast many days. I had packed a bunch of Clif bars figuring that would be my lunch. I ate better on the jobsite than many days at home. People would also stock the coolers with water, pop and beer each day. The end of the days were a time to enjoy a beer, unwind, step back and reflect on what we accomplished in the day. When you're buried in the details it was hard to see the progress, but we knew progress was being made somewhere. Like all construction projects, there are days when it seems like nothing got done. A few years ago I had a customer come home and in a pretty pissy voice say "what did you even do today?" Those days are bookended by the rush of tearout day and the last couple of days when it all comes together. And the last day was a rush. Sunday was supposed to be devoted to cleaning, but we just had too much left to do. In the last hour or so before the Lindens arrived, there was a mad dash to clean up the tools and leftover materials, get the furniture back in the house, and at least do a little sweeping and dusting. Some of the kids had made a banner welcoming home Matt and Holly. We had lots of kids running around all week, pitching in where they could, with their Moms splitting time between working and keeping an eye on them. The reveal went pretty well. The Lindens were led around the house to see all the changes. They seemed pretty impressed with how much we had accomplished in a week. Of course the family room was still sheetrock and studs due to the work stoppage, but we didn't want to share the reason until we had the permits situation resolved. We shared hugs, a few tears and more than a little wine. I stayed over a couple extra days to finish up the deck and try to help clean up a bit. It was also nice to see Matt and Holly for a couple extra days. I wish I could have stayed to see the job to completion, but it wasn't in the cards. People are taking this weekend off to give the Lindens some time by themselves and to regroup. The makeover project was an amazing experience. The video on Annabelle's Circle from Monday May 26th gives you an idea of the mass of people and projects that were going on at one time. Matt just walked from the front to the back of the house catching everyone in action. There were so many great people involved. Some I knew, some were names I had heard over the years but had never met, and of course many others were complete strangers. Everyone was great. Several people commented on how hard I was working, but when I looked around as darkness fell, there were lots of others painting and sanding in the dark. There were a couple of times where we had to stop people to tell them to go home. Matt and Holly are wonderful people, and their circle of friends are brilliant. It was my honor to work beside them all. We all wish there was more we could do for them. Some will be back in the weekends to come to help Sean get things buttoned up. The home is in a bit of disarray, so the Lindens are probably still feeling a bit displaced. And of course an updated house doesn't make everything all better. They need our continued support and prayers in the months ahead. But hopefully looking around the house will remind them that they are surrounded by people who love them, and that we are here for them always. I flew down to San Diego two weeks ago. As I was carrying tools down in my luggage, it was going to be tough to come in under the 50 pound limit. I did some packing and weighing a couple days early and found out that some of the tools would need to stay home. When I weighed the bags at the airport, both came in at 48 pounds. whew. When I got on the plane, someone was sitting in my seat. As I approached him in the crowded aisle, I did the pointing at him, pointing at me, pointing at the seat number motion. When I reached him and explained he was in my seat, rather than looking at his own ticket, he asked what seat numbers the couple next to him had. Not sure how that clarifies his seat assignment. He finally checks his ticket and realizes he was a row off. I should have kept quiet. When I sat down I realized that the man next to me was rather large. He needed to flag down the flight attendant to get a lap belt extender. There was no question of fighting over who gets the armrest as he was a good six to ten inches into my seat. I'm no waif myself, so I spent the flight down twisted sideways, and started the week stiff and sore before ever lifting a hammer. I had sent home some things with the wife, so my luggage was hopefully lighter for the flight home. They came in at 48 and 44 pounds. Then she asked for my ID. "Did you know this is expired" she asked. Nope. It had expired two days earlier and I hadn't realized it. As a birthday present she flagged my ticket with a red mark that must mean 'trouble-maker'. When I got to security, the gentleman checking tickets kind of chuckled and asked what I did wrong. There was no chuckling at the metal detector and scanning area. I was placed in a plexiglass box while my bags came through the scanner. Though there was no top to the box, someone had thoughtfully drilled some air holes in the door. Some ladies ahead of me were kind of laughing, so I scratched on the glass like a dog trying to get out. At least they had a sense of humor. After patting me down and swabbing my bags for explosive residue, I was sent on my way. It was all very professional, and my fault for not renewing my license before I headed out of town. Back at the gate I had looked into changing my seat assignment as I was in a center seat toward the back of the plane. The other available seats were also center seats, but much closer to the front. I decided not to do any switching this time and it turned out for the best. The two guys I was sandwiched between were pleasant, as was the flight home. The trip to the DMV this morning wasn't too painful either. Things are turning around. I am back home after two weeks away. It was a trip to Lemon Grove, California to help remodel a home for some friends in anticipation of the arrival of their new baby Annabelle. For those of you who know Matt and Holly (and even those that don't), I hope you followed the story at annabellescircle.blogspot.com. It really was an amazing experience. The wife and I have headed down to California a number of times to see our good friends, but this trip was different in a lot of ways. We traveled separately, as I headed down almost a week ahead of her, and stayed a few days beyond. We were there to work, so there was no beach time, but we still spent time with friends (most often with tools in our hands). My wedding ring was off for two weeks, as I don't like working construction with it on. It sat safely in my backpack until the flight home yesterday. The wife and I were also apart on my birthday. Not a big deal to me as I am not big on celebrating it, but I'm sure she would have liked to have remained in California with me. I spent a nice evening with Matt, Holly and some other friends relaxing on the new deck. I lived a bit of the life of a vagabond during the project. Each night around 8:00 as the sun was setting and the headlamps were coming on, someone would ask "so, where are you sleeping tonight?" I wanted to stay near the project in order to get an early start each morning. I was able to stay at the house most nights either in a bed or in a sleeping bag inside or on the deck, but I also stayed with my brother in San Diego and with the other Sean in Oceanside. My luggage sat in the back yard and I would load my backpack with the essentials for the next day. I arrived home last night around 10:30, gave the pooch a good scrubbing, paid the bills that stacked up while I was gone, then fell into bed and a deep sleep. This morning I cut my hair and shaved off the drifter's beard I grew over the last two weeks. After showering in our wonderfully soft water, I began to feel clean again. The last couple weeks felt a bit like camping - you're never really clean, just a little less dirty at times. For those that know me, living outside for two weeks is a treat. Scraping off the dust when it is all over still feels pretty nice though. Then it was off to the DMV (explained later), then to work and the 500 or so e-mails to plow through. Glad my work week is only one day long. I have some catching up to do.